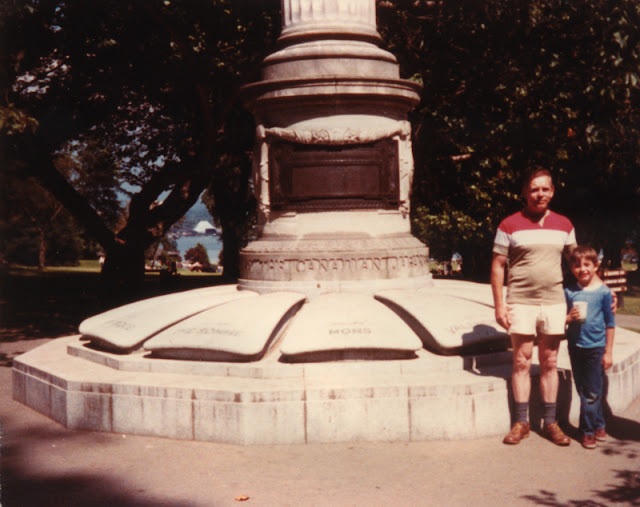 As part of my continuing quest to digitize the Woods family photos, I scanned this image of Sean and Dad in Vancouver some months ago. While I prefer to scan negatives rather than prints, in this case I had no choice since the negative was the Kodak 110 variety, which my scanner can't accommodate - or so I thought. Last week I found a method of scanning irregular negatives, and stumbled across this image's original negative. 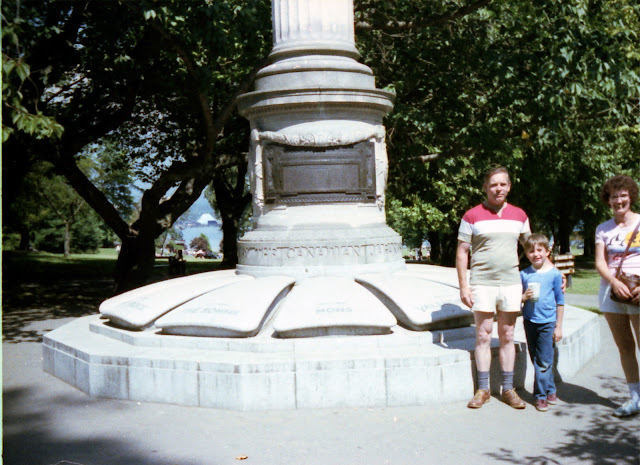 Not only does scanning the negative result in a sharper, truer image, it reveals that Mom was in the picture as well, although half-cropped thanks to my bad aim. I was stunned that the developer - the local drugstore in Leduc, in this case - would crop someone out of an image, even if it did result in a better composition. I suppose I should have realized years ago that the practice must have been fairly common, given print sizes of the day and other factors. But Mom's newly revealed presence shows my original intent: to photograph not just Sean and Dad, but all three of my nuclear relations in front of the memorial. I've long wondered why Mom wasn't in the shot, sometimes imagining that she must have been off wandering in the park or perhaps getting ice cream or something. Now I know she was there and I simply screwed up the shot. This is by no means an Earth-shattering historical revelation, of course, but it does give one pause to wonder how many other little details are casually filtered out of our collective amateur history.